The Hindustan Motors and Mitsubishi alliance has been largely soldiering on in India with the Pajero Sport and Montero SUVs. 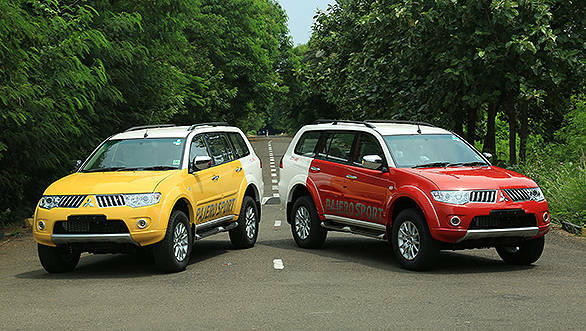 Now the coalition has changed its name to Hindustan Motors Finance Corporation Ltd (HMFCL) and also introduced dual tone colours for the Pajero Sport. The two new colours - Flame Red-White and Lemon Yellow-White, according to the company, have been received quite well. The changes are not restricted to just the new colours. The new HMFCL Pajero Sport gets new graphics, a DVD player and a refrigerated compartment. HMFCL says that the new Pajero Sport has been well received by SUV enthusiasts. The powertrain for the new Pajero Sport is the tried and tested 2.5-litre turbo diesel which makes 178PS of power and 400Nm of torque. It is mated to a five-speed manual transmission. HMFCL is also in the process of bringing in an automatic variant of the Pajero Sport to India soon. HMFCL managing director, Uttam Bose said, "We have always been customer oriented. We evaluate and anticipate the buyer's likes and dislikes and make suitable changes. More footfalls and higher rate of conversion prove that imparting dual tone to Pajero Sport has clicked with the customers. Buyers can expect more from us in the coming days."